Did you know that each day, on average, you lose some two quarts of water through the skin, lungs, intestines, and kidneys? Why, just by exhaling you lose about one pint of liquid a day. How much more so with sweat from exercise or exertion? Not drinking enough water wreaks havoc on your whole system, especially during exercise/activity. And if you are alive and moving, you are active and burning calories every day. Water is essential for a healthy body and you cannot live without it. You can live about a month without food, but, you will die in about a week without water. Water is necessary to carry nutrients to your cells, remove toxins, lubricate joints and your colon, to regulate metabolism and body temperature among other important functions. What is enough water for you individually? 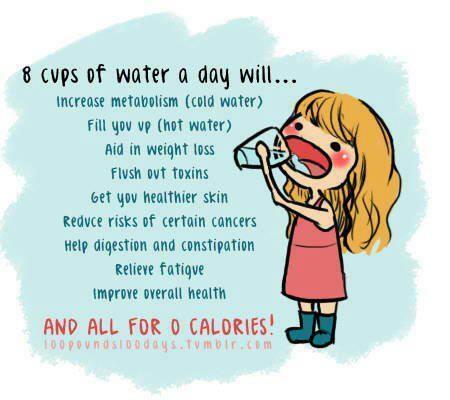 I have been a water drinker for many years and would consume about 6-8 glasses a day. The theory I am recently living by is drinking ½ my body weight in ounces of water. So if you weigh 120 pounds you would drink 60 ounces of water in a day. A little warning here, if you have not been drinking more than 1 -2 glasses of water a day do not jump to 6-10 glasses in 1 day. You will set yourself up for defeat. Have you ever tried pouring a lot of water on a dry plant? What happens? It runs right out. That’s what will happen to you too. You will be spending a lot of time in the bathroom. Build up to it; add ½ a glass more a day until you reach your goal ounces. Replacing those 2 quarts of water you lose a day just through breathing and living is essential to prevent being dehydrated. Waiting until you are thirsty to drink is too late, you are already dehydrated. Remember, it is not just your mouth that feels the effects of a lack of water! Your brain, which is mostly water, is extremely sensitive to any dehydration or depletion of water content. Dehydration can cause mental confusion. The human body is composed of 80% water; don’t you think it is wise to keep it that way? By the way when is the last time you had a full glass of water?